Caroline Penland, a junior at the University of Georgia, shares her thirst for adventure in her blog below. I remember seeing sandboarding pictures from the LEAD Cape Town trip last year and thinking to myself, “I HAVE to try this someday.” If you do not know what sandboarding is, it is basically like snowboarding, but on giant sand dunes instead of a ski slope. I have been snowboarding before, but this looked way cooler. I have wanted to try it out so badly ever since I saw those cool pictures. 1. It’s not cold. 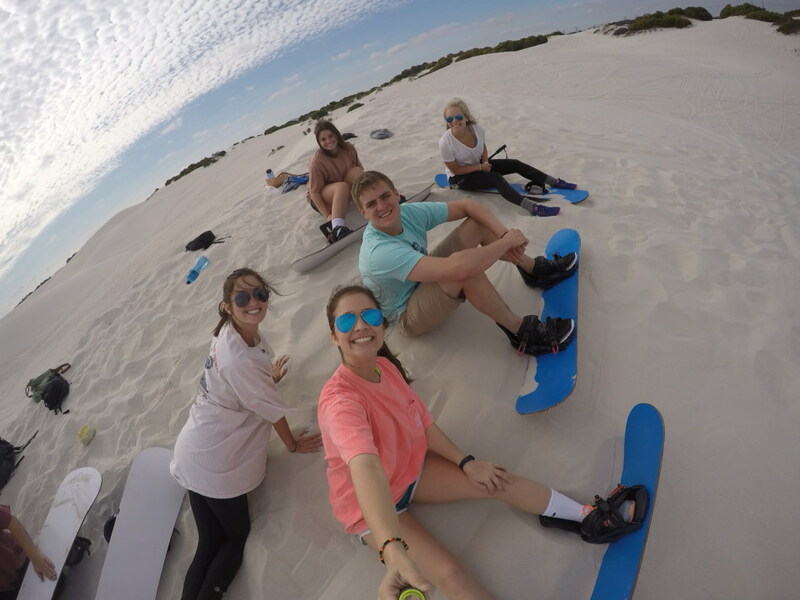 If you dislike being cold as much as I do, sandboarding is perfect for you!! You get to have the awesome experience of standing on a board, but you get to do it while wearing a t-shirt and shorts instead of bundled up in ten different layers of clothing. Win-win situation. 2. The view. I stepped off the bus to find myself standing in front of a view so breathtaking it looked like it could be a screensaver. The giant dunes are absolutely gorgeous. When you stand at the top of them, there is smooth sand as far as you can see. 4. Great workout from hiking back up the hill. The hills are HUGE. Not only do you get to have an exhilarating ride down, but you also get a nice workout in on your way back up! Chairlifts are for wimps. This is hands down the coolest thing I’ve ever done. I want to go again tomorrow.